This picture defines the primary role of the Lovat Scouts better than words. Described at a Web Address as a 'very special regiment', they were all of that, and more. Click on 'Regimental History' below, and see. 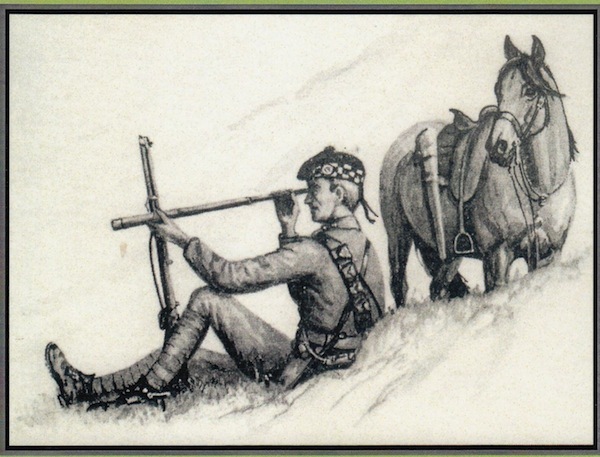 Although originally set up in Invernes-shire, many Ross-shire men, and from other neighbouring counties such as Sutherland, Caithness, and Moray and Nairn, served in this remarkable, and unique Regiment. For more information see the remarkable book for a comprehensive history of the Scouts, and photographs from Librario in Kinloss. Our picture, above, has been borrowed from it. Their War Memorial is located in the centre of Beauly, on the A862, some 11 miles from Dingwall.